Edinburgh Castle is a magnificent site, standing proudly on the high rock in the heart of Edinburgh City. Edinburgh is the capital of Scotland and this Castle has a huge and important history. The oldest building within the Castle is a 12th Century chapel which is dedicated to St Margaret, the wife of Malcolm Canmore. It is thought to have been built by their son David I. During the Wars of Independence Edinburgh Castle was occupied by an English garrison. In 1313 the Scots, led by Thomas Randolph, climbed the rock to surprise the troops and recaptured the Castle. In 1440 the Earl of Douglas and his brother were murdered at an event now known as the Black Dinner. The Castle was attacked and captured by the Douglases. James the VI was born in 1566 in the Castle. His mother was Mary Queen of Scots. The Castle saw more conflict during the Covenanting times, the Cromwellian invasion and the Jacobite Risings. The Stone of Destiny, on which Scottish Kings were inaugurated, is housed at Edinburgh Castle. It is steeped in history. The Stone of Destiny was taken to Westminster Abbey, London in 1296 by King Edward I and not returned to Scotland until 1996 by Her Majesty Queen Elizabeth II. The Scottish crown jewels are held at Edinburgh Castle. They are known as the Honours of Scotland and can be found in the Crown Room of the Royal Palace. The Scottish crown jewels are over 500 years old and consist of a crown, sceptre and sword. During the Coronation of Mary Queen of Scots in 1543 the Honours of Scotland were used. 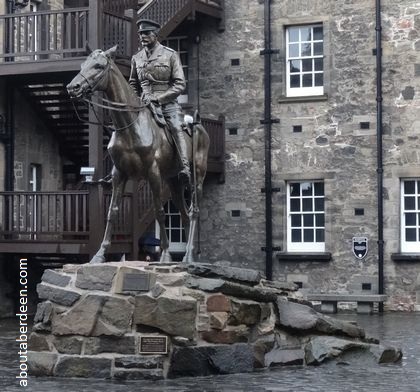 There is a statue of Field Marshal Earl Haig sitting on his horse at the esplanade. Field Marshal Earl Haig and the Prince of Wales opened the National War Memorial in 1927 at Edinburgh Castle. The Edinburgh Military Tattoo takes place each year on the esplanade. The oldest building in Edinburgh is the St Margaret's Chapel which was thought to have been built in the year 1130 by King David, her son. It sits by the top of the rock. Big Tam fires the One O'Clock Gun each day at precisely 1300 hours, except on a Sunday. The One O'Clock Gun has been fired since the year 1861. There is alleged to be a one mile underground tunnel from the Castle to Holyroodhouse. A piper was once sent through the tunnel, commanded to play his pipes as he walked the tunnel. He was never seen again, but the sound of pipes has often been heard. A ghostly drummer, sometimes headless, has been witnessed. He appears to warn the inhabitants of the Castle that it is about to be attacked. There is a pet cemetery within the castle and a dog buried there still haunts the battlements. 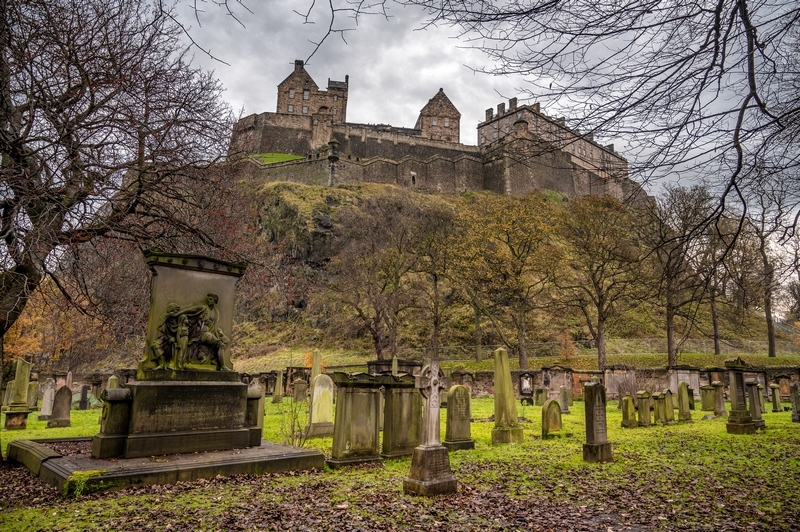 Some visitors to Edinburgh Castle have heard the ghostly wails of former inmates of the dungeons. Sceptics of the ghost stories believe that there are no truth in them because soldiers who are posted to Edinburgh Castle have never filed a report of seeing a headless drummer, hearing the phantom piper or seeing a ghost dog - like a big butch squaddie is going to report such a thing! It's a Long Way to Tipperary: British and Irish Nurses in the Great War by Yvonne McEwen describes how the ordnance store of EdinburghCastle was commandeered for the use of military casualties during the Great War since it had been converted into a hospital in previous years. During World War 2 was not designated a prisoner of war (POW) detention centre or camp. However German enemy airmen of the luftwaffe who were shot down over Scotland were treated in the Edinburgh Castle hospital. In 2008 Edinburgh Castle had a bit of a face lift when the outer wall of the Castle, which can be seen from Princes Street, was re-pointed by Masons using traditional lime mortar. This Western Defences area had scaffolding erected but with a difference. From Princess Street it looked like the scaffolding was hanging in mid air whilst abseilers tended to the walls removing weeds and re-pointing the mortar, mortar joints and stone finials. This was because the railway lines are close to the ground under this area so ground level up scaffolding could not be erected. So a specialist company built a custom made cantilevered scaffold system with a weighted end at the inside of Edinburgh Castle to allow the Historic Scotland Monument Conservation team to do their work. This cantilevered scaffold system also meant that the scaffolders could reduce the amount of anchor fixings directly into the aging masonry. The masonry area being treated was the Sallyport which is the back entrance to Edinburgh Castle, Scotland. This was historically a weak point of attack at the Castle and was where Jacobites tried to enter the Castle during the 1715 Rising. After this it was blocked up and a guardhouse with sentry posts added to give guards a better observation along the flank walls. The Great Hall in Edinburgh castle has for some time been thought to have been commissioned by either James IV or James V and it was not until 1999 that historians and archaeologists were able to give a definite answer. Archaeologist Dennis Gallagher and dendrochronologist Anne Crone were able to study the 14m high roof during cleaning work of the hammer beam roof and on analysing the principal trusses the timbers dated to being felled between the years 1505 to 1510 and were not Scottish Oak but were of Scandinavian origin. So James IV was responsible for the creation of the Great Hall which was completed in 1511 though sadly did not live long enough to enjoy his efforts for he died in Flodden in 1513. Visitors to the Great Hall in Edinburgh castle can view the fleur de lys corbel on the north side which symbolises kingship with France. Another corbel is the familiar lion rampant and there are several corbels with the royal shields of James IV and angels. Corbels on the south side have decorations such as a marriage cup and Tudor rose. The Great Hall has had many uses during the centuries. James IV had hoped that Parliament would sit there but the reality is that it was used as a workhouse and then a hospital before being used as a barracks for troops of Cromwell which saw the installation of galleries. A century later these were stripped so that redcoats could be housed: the Greta Hall was partitioned and floors added and then the beautiful ceiling was dull plastered. The Great Hall was then used as a military hospital until the early 1880s when the Hall was to be used once more as a banqueting hall. The hospital moved to the Ordnance Storehouse. Fortunately restoration during the years 1887 to 1891 was able to once more reveal the hammer-beam roof. This was overseen by the Edinburgh architect Hippolyte Jean Blanc The Great Hall of Edinburgh castle did boast a visit by Charles I when he greeted courtiers before his coronation at Holyrood Abbey on the 18 June 1633. There are many events taking place at Edinburgh Castle each year. For example for Christmas there will be music, shows and a visit from father Christmas on one of the Sunday afternoons in December. On another Sunday there will be Christmas Carols sung in the Great Hall. Also taking place in the Great Hall of Edinburgh Castle during December are some Christmas wine and dine events of a four course meal using local ingredients and fine wine. The cost will be cheaper for National Trust members. These Christmas wine and dine events must be pre-booked. Items on the menu include potted hough of Scottish beef with spiced plum marmalade, horseradish coleslaw and bannock bread served with Loredona Pinot Grigio. This is followed by roasted sea bass with chorizo, red onion and cherry vine tomatoes served with Brouill, Domaine de Moulin Faire. The third course is roast goose, crispy streaky bacon and carmelised brussel sprouts with roast potatoes and chestnut stuffing served with d'Arenberg Hermit Crab Marsanne Viognier which will be followed by Castle Christmas pudding parfait with cranberry relish served with Graham Beck Rhona Muscadel followed by tea, coffee and chocolate truffles. There is a full vegetarian menu during the Edinburgh Castle Christmas Wine and Dine Events and this includes wild mushroom and chestnut pate with cocktail oatcakes followed by red onion tart tatin with roast cherry vine tomatoes. Third course is roast root vegetable Wellington served with brussel sprout gratin and chappit tatties. Vegetarian dessert is Castle Christmas pudding parfait with cranberry relish. Christmas Wine and Dine Events at Edinburgh castle for 08 can be booked on 01312204833. Other meals available at Edinburgh Castle in the Great Hall include a members� lunch just after St Valentine Day in February. This wine and dine event is also open to no NT members. Examples of courses range from smoked spiced Rannoch moor venison with a sweet rhubarb chutney and fine herb salad or red onion tart tartin, glazed goats cheese and roast cherry vine tomatoes for starters. Main course includes seared fillet of Inverurie beef with braised shin on horseradish mash with Perthshire chanterelle mushrooms and dark veal gravy or potato dumplings with roast butternut squash, pumpkin and toasted pine nuts. Edinburgh Castle was voted the best UK heritage attraction at the 2011 British Travel Awards. 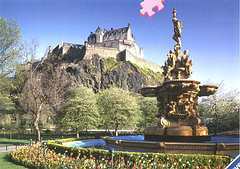 Edinburgh Ghost - such as wee Annie, Mackenzie Poltergeist and the organised ghost walks and tours.